SUPERIOR QUALITY SUPPLIES - All of the items provided in your emergency go bag are premium. 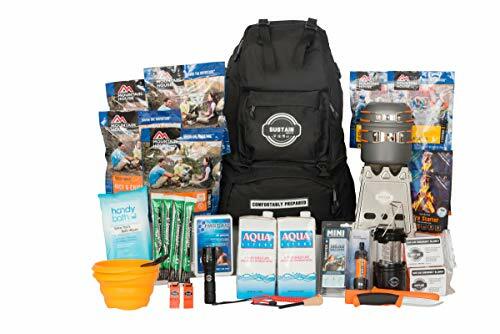 All items included: 12 Mountain House food servings, 2 Aqua Literz waters (33.8oz refillable cartons), 1 Sawyer Mini, 4 Cyalume SnapLights, 1 LED lantern, 1 flashlight, 1 fully stocked First Aid Kit, bath wipes, 2 emergency blankets, 1 portable stove, 2 bowls and utensils, 1 MoraKniv knife, 1 Ferrocerium rod, 2 InstaFire tinder, and 2 whistles. ALL YOU NEED IN ONE PLACE - With this emergency go kit, you'll have the peace of mind that you have all the premium supplies needed for survival during an emergency. Save yourself hours of searching for individual products and money from purchasing them separately with one bag that's ready to go. LIGHT SOURCE OPTIONS - Power outages are the most common after-effect of disasters. With this emergency survival bag, you'll have light sources, a fire-starting device and tinder. Kit includes: a flashlight, Ferrocerium rod, SnapLights and an LED lantern to help illuminate the night. BASIC FIRST AID - After an emergency, health care providers may not be able to reach you for some time. Be prepared to administer minor first aid to your family with the first aid kit in this emergency survival bag. First aid kit contains: variety of bandages, pain relievers, ointment, gauze & tape, sanitary gloves, and a first aid guide.